After high school, Carl Moore worked in construction and at a car wash but wanted something more meaningful. He enlisted in the Army in 2008 as a fire support specialist. After training at Fort Sill, OK, he was assigned to the 1st Brigade, 101st Airborne Division at Fort Campbell, KY.
On June 4, 2013, SSG Carl Moore was on a dismounted route clearance mission with A Co. (ENG) 1 STB, 1st Brigade Combat Team, 101st Airborne (AASLT) Division, in Boti Kot, Afghanistan, when his patrol came under attack by heavy enemy machine gun and Rocket Propelled Grenade (RPG) fire. During the ambush, SSG Moore was struck by multiple rounds, which resulted in a spinal cord injury and partial paralysis from the waist down. During his rehabilitation at the James A. Haley VA in Tampa, Carl learned to use a wheelchair and eventually how to walk again. He can now walk short distances with the assistance of a walker. Upon his return home, Carl faced challenges with daily routines. In his previous home, he had trouble getting through the front door while in his wheelchair, and taking his dog out for a walk. His specially adapted custom HFOT home with an open floorplan and automatic doors alleviates these problems. The financial freedom that he has living in a donated home enables him to provide for his wife, Heather, and daughter, Addison. In the years since his injury, he and his family have had to move several times, so he is happy to now have the stability of a permanent home. Originally from Arkansas, Carl chose to build his home in Florida, for its proximity to the VA and the active lifestyle and sports available to him throughout the year. An avid outdoorsman, Carl enjoys hunting, kayaking and fishing. He is also a member of several shooting leagues at ranges in his community. He plans to start college at the beginning of 2019. He spends much of his time working with a non-profit, Learn to Shoot Again, teaching adaptive shooting. 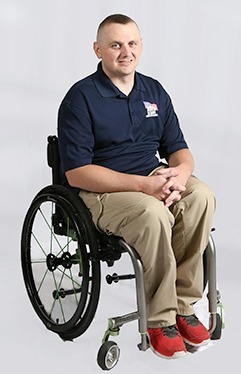 Carl would like Homes For Our Troops’ supporters to know they are making a difference in his life and in the lives of many other injured Veterans. “The financial security that comes with not having a mortgage takes a huge weight off the shoulders of Veterans and their families,” he says.